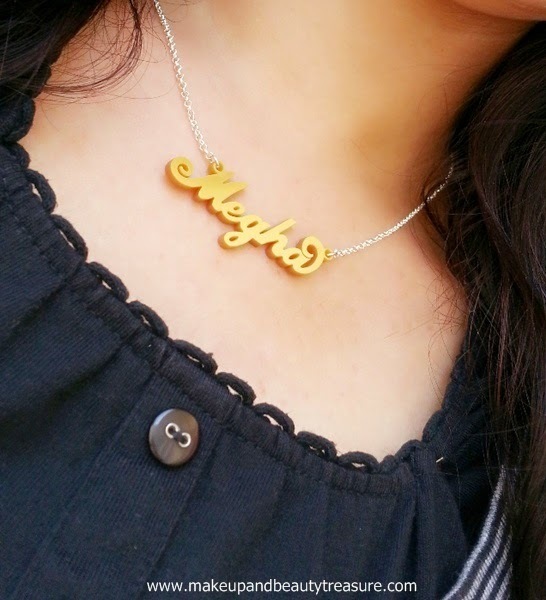 I was thinking of getting a personalized name pendant for a long time (just to advertise my identity to everyone haha!) but did not find any desired design. Namefully was like a Santa to me and delivered my name pendant at my doorstep. Namefully is a US based jewellery brand that creates beautiful name jewelleries for its customers. 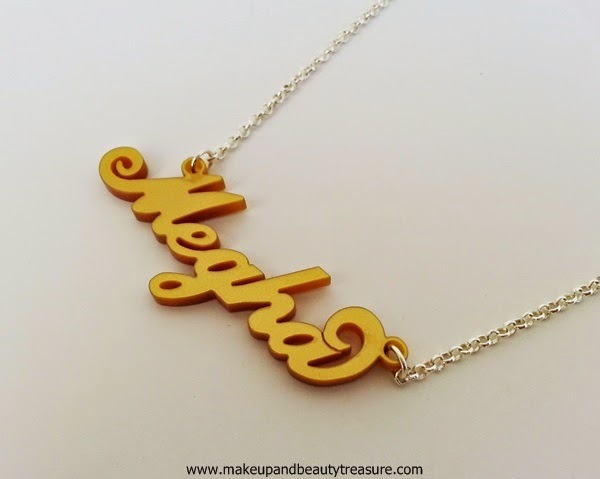 Today I am going to review their new Namefully Acrylic Name Necklace. Namefully Acrylic Name Necklace comes in a netted case with a beautiful white ribbon to enclose it. The actual product comes attached on a cardboard packaging and looks really delicate and girly in the netted case. The name necklace is made from acrylic and is very light. It had Carrie writing style and looks very stylish and unique. You can choose the color of the pendant as per your choice out of 15 different colors- red, blue, green, orange, white, black, yellow, transparent red, transparent blue, transparent red, transparent orange, silver, silver mirror and gold. I chose Gold color. You are then asked for the chain length. I chose to go for 14” chain length as I prefer short chains over long ones. It is silver plated rolo chain and is of really good quality. Make sure that name necklaces have a 9 letter limit. The pendant is carved beautifully and looks really chic and pretty. It complements well with all outfits that I really adore. It can dress up any boring outfits but I love wearing it with black outfits to make it stand out. I get compliments from people each time I wear it. The chain is quite sturdy and looks pretty on neck. It is of good quality and does not cause any allergy or reaction. The clasp is quite strong and is easy to open and close. The pendant feels quite light and does not tend to spin around or gets tangled though it does tend to tilt each time I bend. It is of good size and does not look tacky. I think it would look great on girls in their 20s or 30s. 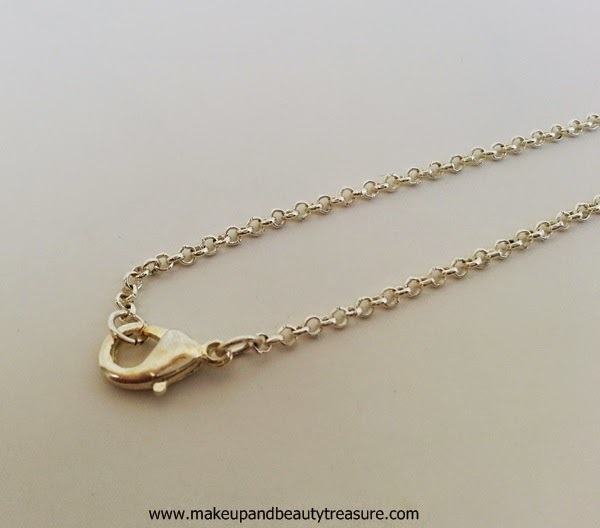 The necklace looks lovely and unique and would definitely make a beautiful gift! • Looks chic and funky. • Chain is of good quality and does not lose its luster even if you wear every day. 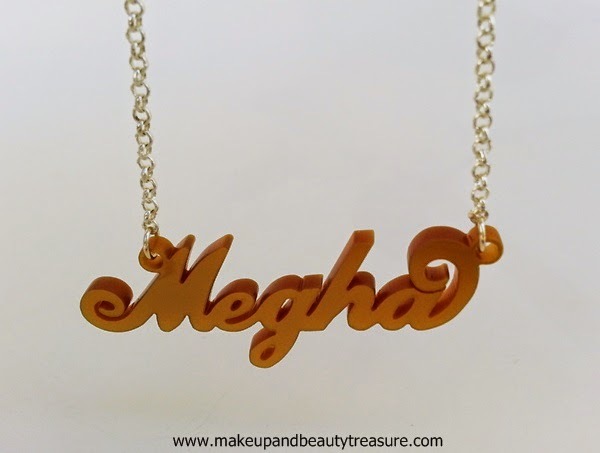 • Name pendant is beautifully carved. • Easy way to advertise your identity. LOL! • As it is quite light, it tends to tilt if you bend and you need to adjust it. 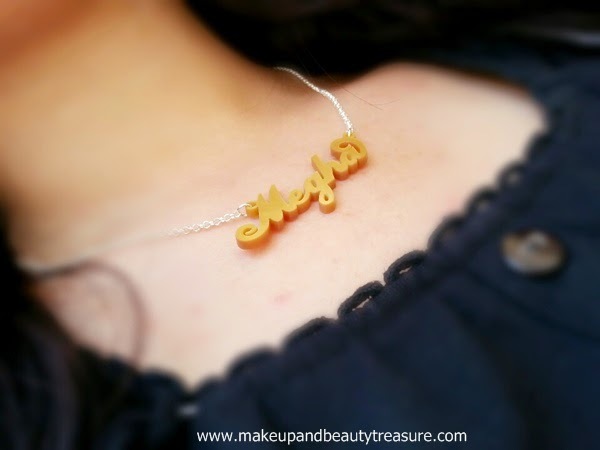 Namefully Acrylic Name Necklace is unique, pretty and fun jewellery that I feel every girl must have. It is very light and looks funky with almost all outfits. I have been using it almost every day and there are no signs of wear and tear. The name is beautifully crafted and is worth every penny. I would happily recommend it to everyone! 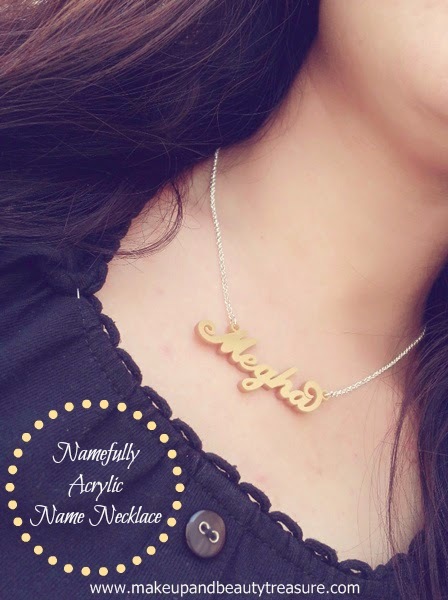 Have you tried Namefully Acrylic Name Necklace? How was your experience? Share in the comments section below!